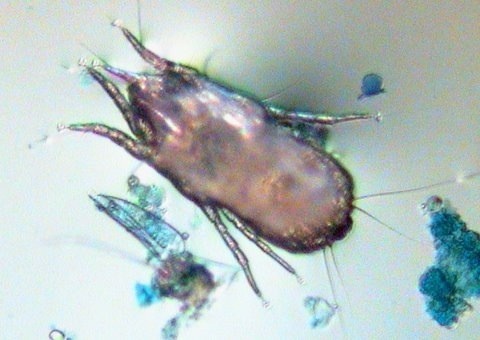 A newly discarded skin scale is not considered food for a hungry house dust mite. To become mite food the skin scale has to go through a process of decomposing change. It must become swollen with water, carry bacteria, microorganisms, yeasts and fats broken down by fungi. A newly discarded skin scale is 'home' to yeasts and microorganisms, the normal flora associate with healthy human skin. However, when the environment of the scale changes these resident organisms die out and are replaced by different opportunistic fungi, moulds and yeasts known to thrive on decomposing organic matter. The skin scale itself is made of tough fibres (keratin) that can be difficult for the mite to digest. We known this because researchers found remnants of partially digested skin scales in mite droppings. Perhaps, the skin scales acts as an eatable plate full of food for the mite. The perfect environment to ripen a discarded skin scale must be warm, damp, dark and still for the fungi, yeasts, bacteria and microorganisms to grow. That environment can often be found in beds and bedding, or anywhere that long periods of time is spent resting, such as relaxing on sofas, or comfortable chairs. 'Dust Mites', Matthew J. Colloff 2009, CSIRO PUBLISHING, ISBN 978-0-6430-6589-5.